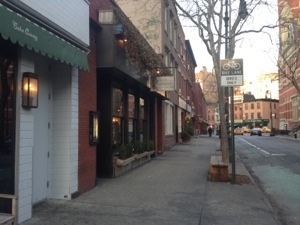 On a cold and rainy Spring evening I ventured out to Kingswood, the West Village’s quaint styled bar. 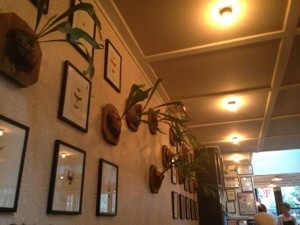 Located on quiet W 10th street, upon immediately entering the restaurant I noticed the warm ambiance. Dimly lit, welcoming wooden tables, and an array of foliage (included a peacock in the back) immediately gave the welcoming, trendy vibe. A few couples were having dinner, while sitting at the bar was a group in their early 30s, enjoying happy hour. The atmosphere was incredibly laid back, and the hostess was welcoming. Upon sitting down, we immediately went for the cocktail menu to help warm us up after our walk. They offer a large variety of wines, beers, and specialty cocktails. We chose the Kingswood No. 3 and the Jefferson Market Lemonade. One of my favorite things about Kingswood, is their seasonally changing menu. The Jefferson Market Lemonade was refreshing with a hint of sweetness that reminded me of an adult version of the classic lemonade stand. My personal favorite was the Kingswood No. 3, which was made with Earl Grey syrup. The drink was smooth and well mixed. The appetizers were the perfect amount for two people to share. 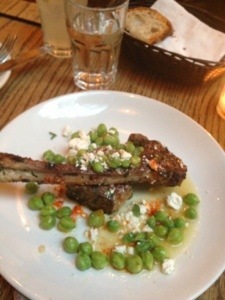 The lamb was perfectly cooked, and the chickpeas and goat cheese it was paired with complemented the dish. The creamy texture of the cheese/chickpeas against the spicy meat was heaven. For those of you who do not know what burrata is, it is a fresh cheese made of mozzarella and cream. It’s hard chewy exterior and creamy interior makes a delicious spread. The bread offered with the dish was too tough with the creamy cheese, but a quick substitution of the house bread fixed the situation. For entrees, we chose the seared scallops and Kingswood’s famous burger. I can’t tell you how many people I noticed at the bar enjoying a burger, and after a bite, I don’t blame their choice! The burger was cooked medium rare, lightly seasoned, and was on the larger side. Served with seasoned fries, it’s the perfect dish to eat at the bar or with a group of friends. The seared scallops melted in your mouth. 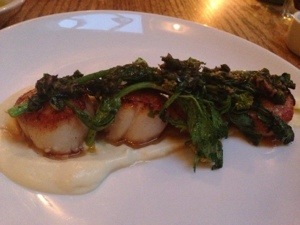 The bitter taste of the broccoli rabe against the velvet texture of the scallops was to die for. Although our bellies were stuffed, we split the carrot cake for dessert. Kingswood isn’t a gastropub where you “grab and go”; it’s alluring ambiance makes you want to linger. Thus, we sat with our coffees, fought over the last bite of spongy carrot cake, and held our composure at trying not to lick the plate. This West Village eatery may still be a “baby” in comparison to longer businesses around it, but it’s here to stay. Whether stepping in for a refreshing cocktail on a hot summer night, or snuggling in the corner with a glass of wine and an appetizer, Kingswood’s trendy relaxed vibe will keep you coming back.